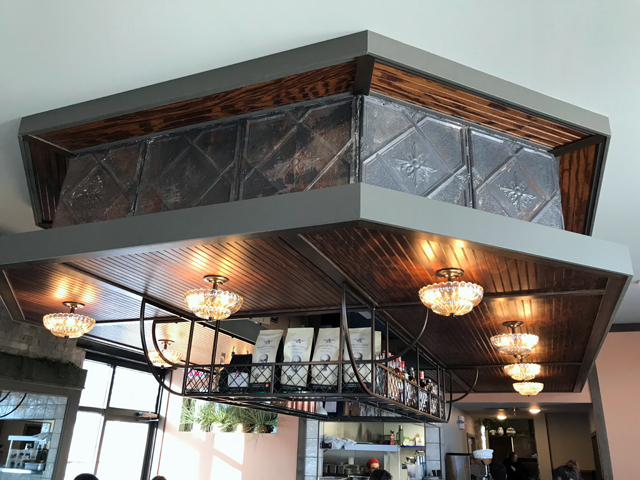 Uncle Wolfie&apos;s Breakfast Tavern occupies a 1902 Miller tied house saloon building that stands atop the Brewers&apos; Hill bluff. Published March 19, 2019 at 9:16 a.m. 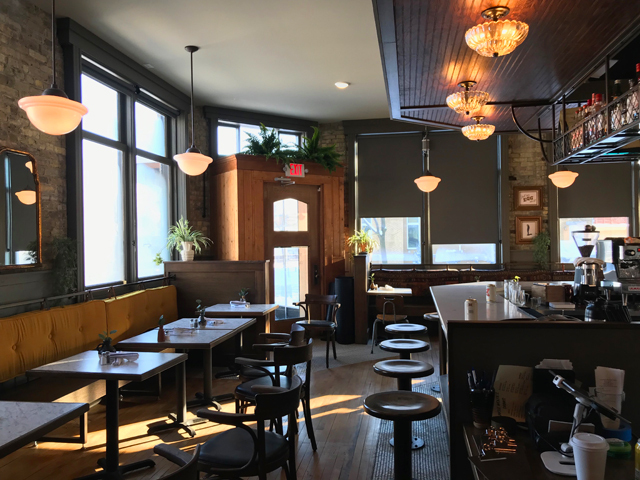 The former tavern that stands on the corner of Hubbard and Vine, atop the bluff on Brewers' Hill has long been the stuff of dreams. 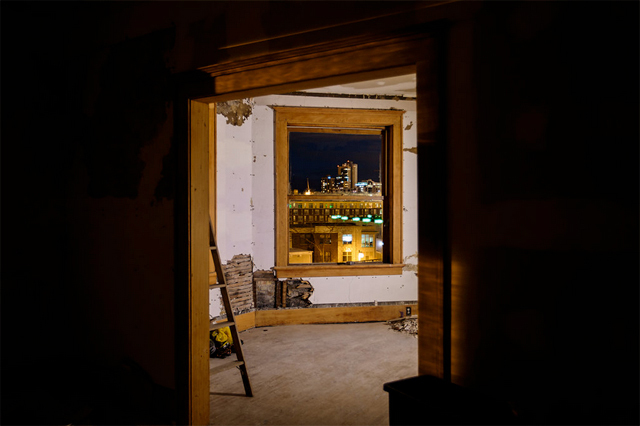 Shuttered since around 1983, when the Party House Inn closed, countless Milwaukeeans have stopped, gazed into the dimly lit space at the old bar room at 234 E. Vine St., and thought grandiose thoughts. For a time, I thought I was the only one, but I soon realized there were many more like me. Among them were local musician and then-director of education at Anodyne Coffee Roasting Co., Wolfgang Schaefer, and his wife Whitney. "We were those same people, for so long going 'wow'," says Wolfgang Schaefer. "That was us, you know. We were flipping through, looking at commercial real estate nonstop. I don't know how many places we must have seen and a number of places we actually actively pursued, before I got this email from Whitney that was this place. And I was like was that the building across from Roots? Are you kidding me? "Then all of a sudden it's our charge, and it's like, 'oh, crap, we'd better do something neat. (laughs)"
The Schaefers bought the building in November 2015 from longtime owner Robert Crawford and set about fixing it up. But it was a long, slow process, and Wolfgang has got the photos to prove it. 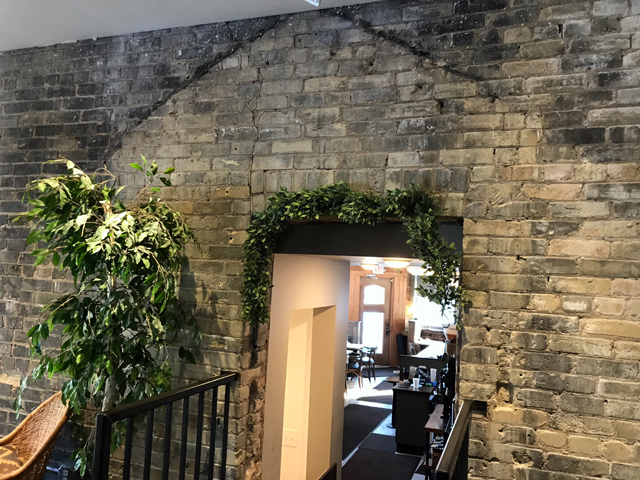 Whipping out his iPhone, he shows me images of the north part of the building with the roof off and no interior floor, and tells me about the basement's wavy, dirt floor that required a crew to come in and lower and even out the floor ... by hand. 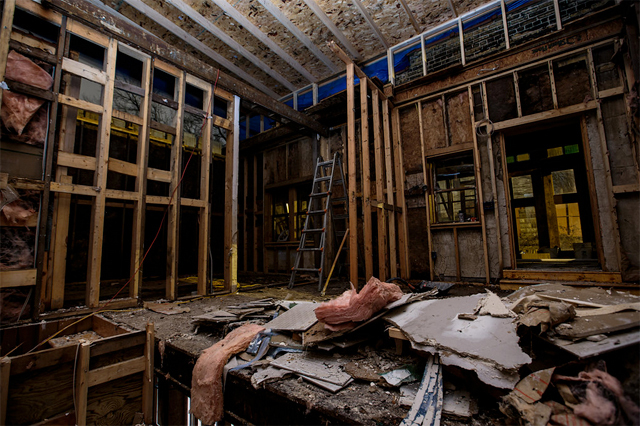 The Schaefers photographed their progress on the project. 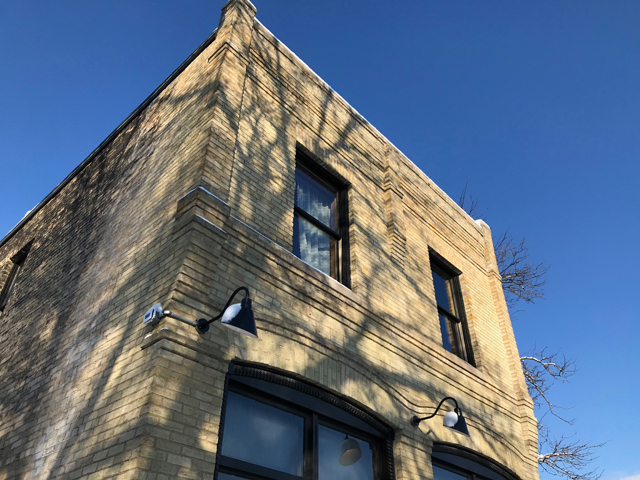 The project has really had three major phases: renovation of the upstairs saloonkeeper's apartment for the Schaefer family to occupy, the renovation of the single-story north addition into the Orange & Blue, which sells vintage and new clothing and home goods, and the conversion of the former bar room and basement into Uncle Wolfie's Breakfast Tavern. "It was almost like every nine months we took on a new project," he says. 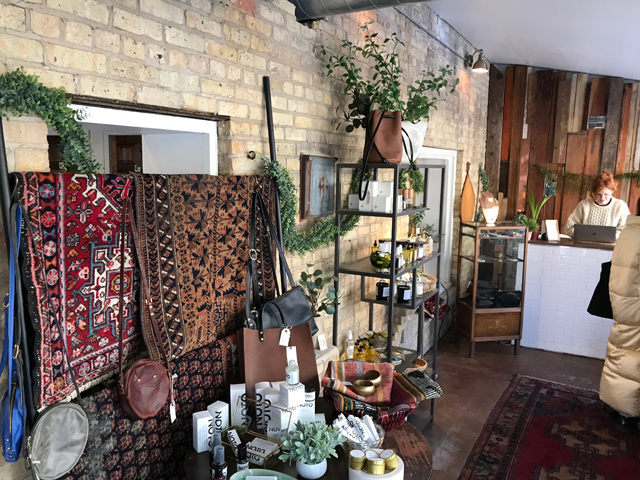 "At first we did the apartment upstairs and then the store. And it's kind of been overlapping because we were sort of working on them in tandem that last step was to do the construction of the restaurant. 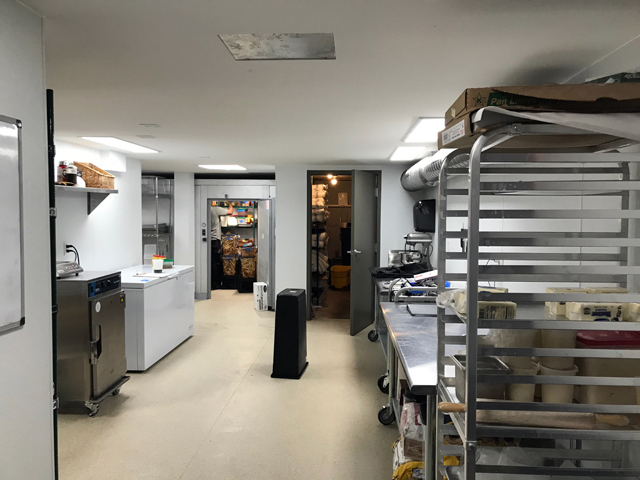 Creating the basement kitchen was no easy feat. The Schaefers moved in during the summer of 2017 and opened the shop around the same time. Uncle Wolfie's opened in December and based on the buzz, is enjoying instant success. The architects William Wolff and Joseph Ewens designed the saloon at 234 E. Vine St. for Miller Brewing Co. in 1902. 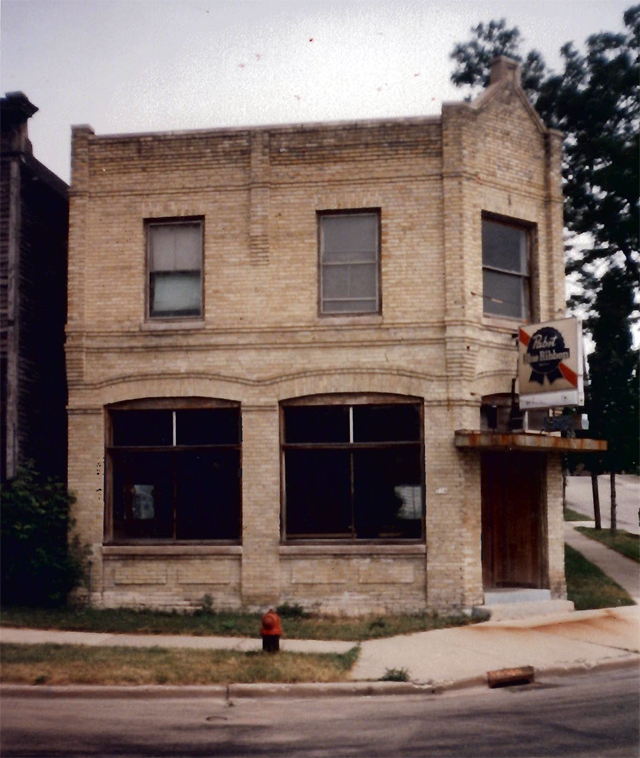 Using a design it would tinker over and over again, the firm drew other tied houses for the brewery, too, including – among others – ones at 2579 N. Pierce St., in 1903; at 1961 N. 30th St., in in 1906; 117 E. Greenfield Ave., and 1102 S. 2nd St., in 1907; and 2499 N. Bartlett Ave., in 1910. Among its most lavish designs for Miller was the Miller Inn, which survives in a much-stripped state on the northwest corner of Mason and Water Streets. You can see how it originally appeared in this post about Miller tied houses. The architects, which occupied an office above the Miller Inn, also designed the nine-story Miller Hotel that stood on 3rd Street from 1917 until 1980. 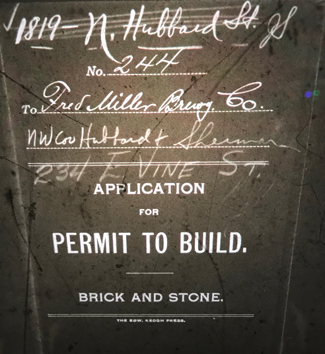 Miller tapped mason Fred Thiel to build the one-story brick building on the northwest corner of Hubbard and Vine (then Sherman Street), which cost $2,800 to erect. 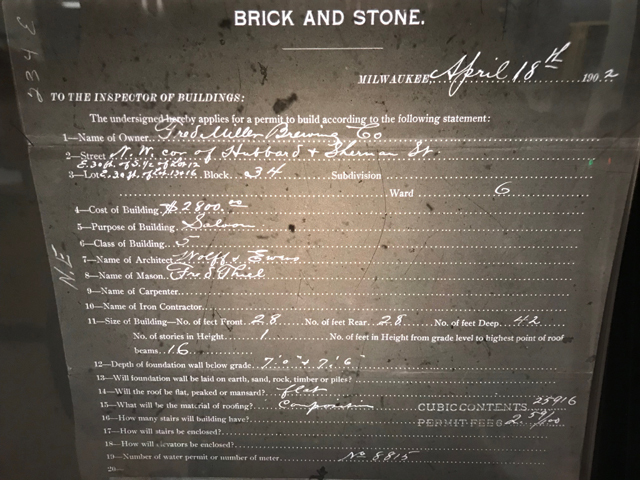 In no time, it appears the saloon was paying dividends for the brewery, which noted its book value at $5,390.17 in 1904-05 (see above) and $5,540.08 three years later (below), with a real estate value of $2,000 and a building valued at $3,540.08. Twenty-seven-year-old, Illinois-born Armand Bartmann was running the place in 1910 and his brother Ed, three years older, was working as a carriage painter just a few doors away. Four years later Miller spent $1,600 to add a second floor to the building. The Bartmanns appear to have held on to the lease for the tavern until around the arrival of Prohibition. By 1917, Ed is listed in the Miller accounts as the saloonkeeper there. By then, the book value was $7,137.92 and the bar was selling both keg and bottled beer. By 1923, Paul Radinkovich was operating the diminutive corner tap as a soft drink parlor and he stayed for a while, biding his time until the arrival of Repeal. It's unclear whether or not Radinkovich resisted the urge to skirt the dry laws, but he did end up in the paper a couple times in 1929-30 for a couple hold-up attempts at his place. In '30 he pulled permits to raze a back cottage facing Hubbard Street, to build a garage and a brick addition on the north end of the tavern that effectively doubled its footprint at a cost of $3,000. Radinkovich stayed until about 1938 when Marko Kapetanich took over and stayed almost a decade before making way for Steve Briks, who seems to have arrived in Milwaukee from Kewaskum, where he ran the Republican Hotel. Bricks was around from 1948 until '51, when a Eugene Repinski stepped in for about a year, until Frank Weber arrived and named the place the Party House tavern. When Blakely Hayes took over for a couple years, he kept the name, and so did Atkins Ellis, who was there from 1959 until about 1962. Junior and Ann Jackson arrived on the scene in '63 and they kept the Party House moniker, too. The Jacksons stayed a long time, keeping the Party rolling in the corner tap until the early 1980s, at which point the bar appears to have shut down, though former barkeep Atkins Ellis seems to have continued to live upstairs until about 1989. At that point, Robert Crawford bought the building and since then it has just sat, with its owner tinkering inside, but not doing much else. 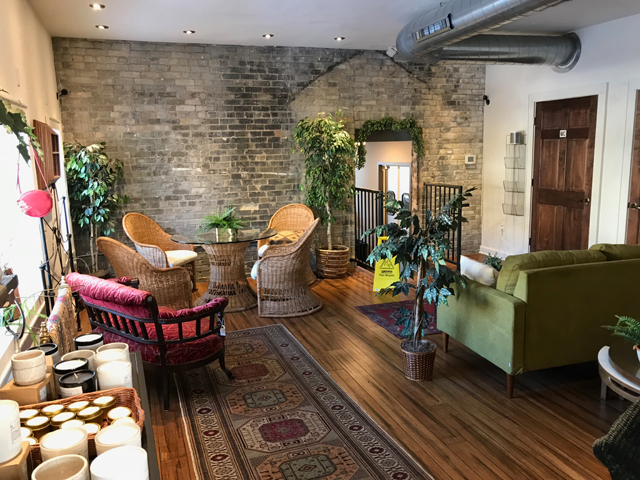 With the restaurant now open, seeing the building – full of life, with a young family upstairs, a retail store and popular cafe bustling – is a joy instead of a heartache. And no one loves the place more than the Schaefers themselves. As he shows me around, Wolfgang's excitement about it is palpable. He points out interesting spots where you can see traces of walls that were once on the outside (including one that hasn't faced the elements since 1930, but still has marks where an overhang was once attached, see photos below), and talks about the quirky array of objects found in the basement, including a woman's purse, complete with ID. Even though he's struggling with a snowstorm related roof leak, he can't stop smiling as we discuss the building's history. But he'll be the first to tell you that it wasn't easy getting to now. "A lot of folks were like 'I was gonna buy it, I was gonna buy it,' but I think maybe they didn't realize the kind of work you have to put into it. "It's insane you know. We did an F-D-A loan or whatever and it's great, but you're just hemorrhaging money all the time," says, "and you just hope you have enough for potatoes and eggs at the end of the day." The Orange & Blue boutique. But, he says, there's just something special about the place. That's what fueled all those dreams. "As soon as you walk in and you look around, you feel this kind of mood," he says, looking around. "And there's this amazing warmth in this place. "Only a tiny portion of it is this décor and whatever we've put into it. That feeling, that was there when we walked in, you know. The minute we walked in it felt like that."